Ten national trade unions and over 100 trade union regions and branches are now affiliated to us. Nicaragua remains the second poorest country in the Western Hemisphere after Haiti. The continued support and solidarity of the UK trade union movement is of vital importance to Nicaraguan trade unions, who often lack the resources they need to carry out their work effectively. Support from UK trade unions has helped them to grow, strengthen their capacity and thus better defend the interests of their members and Nicaraguan workers. NSCAG was registered as a company limited by guarantee in October 2002. 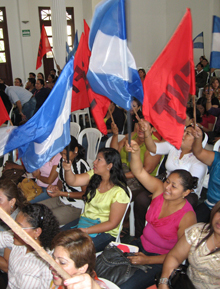 Work with trade unions has been carried out through NSCAG since the Nicaragua Solidarity Campaign became a charity in late 2004.